If a right handed cork screw is rotated to advance along the direction of the current through a conductor, then the direction of rotation of the screw gives the direction of the magnetic lines of force around the conductor. A smooth cardboard with iron filings spread over it, is fixed in a horizontal plane with the help of a clamp. A straight wire passes through a hole made at the centre of the cardboard. A  current  is  passed  through  the  wire  by connecting  its  ends  to  a  battery. When  the cardboard is gently tapped, it is found that the iron filings arrange themselves along concentric circles. This clearly shows that magnetic field is developed around a current carrying conductor. To find the direction of the magnetic field, let us imagine, a straight wire passes through the plane of the paper and perpendicular to it. When a compass needle is placed, it comes to rest in such a way that its axis is always tangential to a circular field around the conductor. When the current is inwards (Fig 3.8a) the direction of the magnetic field around the conductor looks clockwise. When the direction of the current is reversed, that it is outwards, (Fig 3.8b) the direction of the magnetic pole of the compass needle also changes showing the reversal of the direction of the magnetic field. Now, it is anticlockwise around the conductor. This proves that the direction of the magnetic field also depends on the direction of the current in the conductor. This is given by Maxwell’s rule. A cardboard is fixed in a horizontal plane. A circular loop of wire passes through two holes in the cardboards as shown in figure. Iron filings are sprinkled over the cardboard. Current is passed through the loop and the card board is gently tapped. It is observed that the iron filings arrange themselves along the resultant magnetic field. The magnetic lines of force are almost circular around the wire where it passes through the cardboard. At the centre of the loop, the line of force is almost straight and perpendicular to the plane of the circular loop. ’Flux’ is a word used in the study of the quantity of certain fluid flowing across any surface. Magnetic flux deals with the study of the number of lines of force of magnetic field crossing a certain surface. But, B cosθ = component of B perpendicular to the area ‘a’. Magnetic flux lined with the surface is defined as the product of area and component of ‘B’ perpendicular to the area. When angle between ‘B’ and the normal to the surface is90º, ‘B’ will be parallel to the surface as shown in figure. No magnetic flux is linked with surface when the field is parallel to the surface. In this case ‘B’ is perpendicular to the surface. Magnetic flux linked with a surface is maximum when area is held perpendicular to the direction of field. Here, µ is the permeability of the medium and ‘H’ is magnetic intensity, i.e., the number of lines of force per unit area in free space. In case the magnetic field is not uniform, the magnetic flux φB linked with a surface can be obtained as follows. Let ‘dφB’ be the magnetic flux linked with a small area ds of the surface, The area is so small that the field can be considered to be the same over that area. Here,   is a unit vector along the outward drawn normal to the surface at that point. Thus, magnetic flux linked with a surface in a magnetic field is defined as the surface integral of the magnetic flux density over that surface. Any line of force cutting an electric circuit more than once has its effect multiplied by the number of times it cuts the circuit. 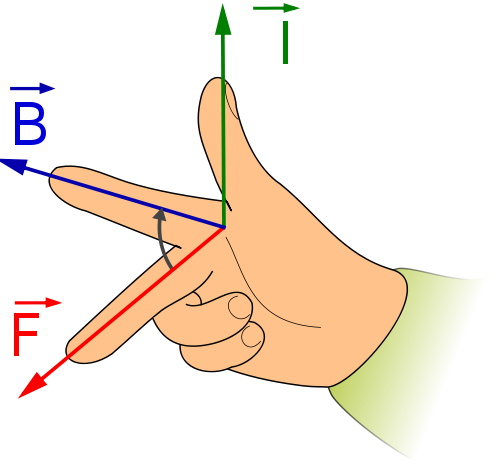 This illustrates the closed right hand rule used for determining the rotation of a magnetic field generated by a moving positive charge. In C.G.S. system, unit of magnetic flux is Maxwell and in S.I. system it is weber or tesla per meter square. Magnetic field strength (H) is the amount of magnetizing force. As stated above, it is proportional to the length of the conductor and the total current passing through the conductor. Hence, magnetic intensity is thus a vector quantity whose magnitude is the strength of a magnetic field at a point in the direction of the magnetic field at that point. The magnetic flux density, denoted by B is also a function of the magnetizing force H.
On the other hand, magnetic flux is the measure of the magnetic field strength of a two dimensional surface, say one particular side of a magnet. In text, it is usually depicted as a cluster of vectors attached to a geometrically abstract surface. Each vector intersects a separate point on the surface. The magnetic lines of force always form complete closed loops. 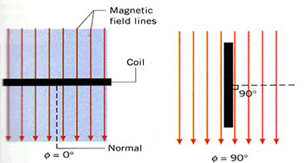 Unlike lines of electric flux, which radiate from and terminate at the charged surfaces, lines of magnetic flux exist all the way through the magnet. The magnetic lines of force behave as if they are elastic. That is, when distorted they try to return to their natural shape and spacing. The lines of force of magnetic field are radiated from the north (N) pole to the south (S) pole. Flux lines do not cross or interact to each other. Lines of force that are close together indicate a strong magnetic field. Lines of force that are farther apart indicate a weak magnetic field. The magnetic field is strongest near to the poles of the magnet were the lines of flux are more closely spaced. Magnetic poles are always present in pairs, there is always a region of the magnet called the North-pole and there is always an opposite region called the South-pole. Thus, from the above observation we conclude that, option (d) is correct. We know the formula of magnetizing force. You might like to magnetic moment. To get answer to any question related to magnetic flux density or magnetic induction click here.